Seasonal Sweetheart: Cheese puffs for a crowd! 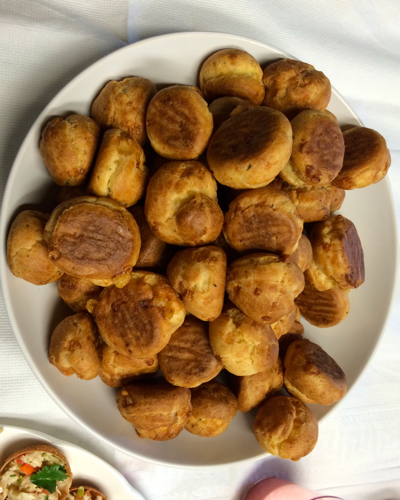 Gougeres are the french term for cheese puff. They are little bits of cheese heaven. It is made with a pate a choux dough. This is the same dough that is used to make eclairs and cream puffs. Pate a choux maybe a little tricky if you have never tried it before. Don't worry, I will guide you through it. In this recipe it is very important to weigh out the flour and the cheese. Also, make sure to use extra large eggs. They provide the structure of this dough and it may not come out properly if you use large in place of them. If you follow this recipe exactly as written, it will come out perfectly every time. I guarantee it. These are great served with champagne or other sparkling bubbly. Heat milk, water,nutmeg, salt and butter in a sauce pan. Bring to a boil. Then add the flour. Stir to combine with a wooden spoon. Place back over heat and mix until dough comes away from the side of the pan. Transfer dough to a mixer. Continue mixing on low speed until cool. Let cool 4-5 minutes or until you can touch the dough with your fingers for 5-10 seconds without burning. If you put the eggs in to early they will cook and you will need to start again. Once cool add eggs one at a time. Wait until the egg is fully incorporated before adding the next. Once the eggs are all incorporated add rosemary and gruyere cheese. Place a tablespoon of the dough on a parchment lined tray. Space about 1 inch apart on cookie sheet. Cook at 350 for 25-30 minutes.